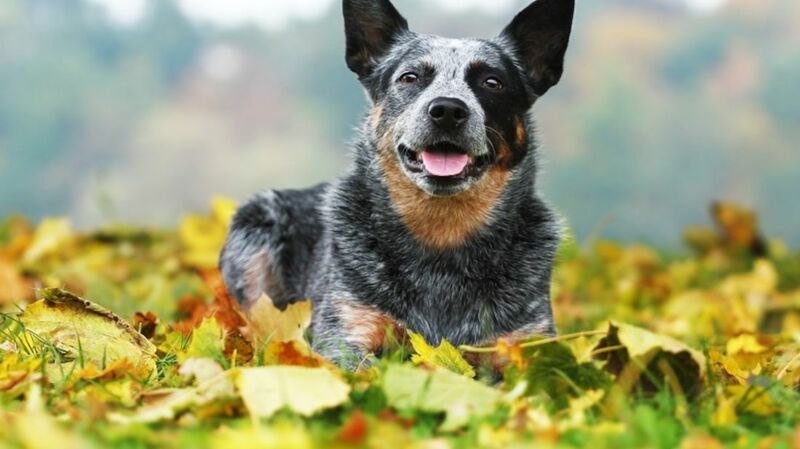 The Australian cattle dog is one of the best herders out there. Their loyalty and intelligence make them great dogs on the farm or in the home. Learn more about this charming working dog. 1. AUSTRALIA NEEDED GOOD HERDERS. When early settlers came to Australia, they brought livestock and sheepdog-like dogs called Smithfields (named after the meat markets in London) to help herd them. These city dogs were not quite cutting it in the unforgiving Australian outback: Their thick coats slowed them down and farmers complained about their strong bite and loud barking. A man named Timmins aimed to create a silent herding dog and bred the “Timmins biters.” Unfortunately, the dogs took their name to heart, and farmers found the dogs would kill calves when not properly supervised. It would take years before an ideal herding dog was perfected in the country, but breeders were determined. 2. THEY HAVE SOME DINGO IN THEM. In 1840, a breeder named Thomas Hall (other research credits a man named George Elliott) crossed dingoes with blue merle collies. The crosses, known as Hall’s heelers, were not perfect but they were much better than previous attempts. The dogs were known to creep up on livestock silently and nip at their feet before laying flat on the group to avoid getting kicked. Hall would continue to experiment with breeding until his death in 1870. This breakthrough in herding dogs caught the attention of two brothers named Jack and Harry Bagust. The duo hoped to improve the line even more by crossing it with a Dalmatian, in the hopes of instilling a love of horses and loyalty toward the owner. This addition caused the breed to lose some of its working ability, so it was then crossed with a black-and-tan kelpie. The result was a compact, spotted, dingo-like dog. Australian cattle dogs today get their agility and speed from the dingo, but their faithfulness from the Dalmatian. 3. WATCH OUT FOR UNWANTED HERDING. Australian cattle dogs are bred to herd, so it’s only natural for them to look for things in the home they can corral when cows aren’t an option. They need to be kept busy, or the dogs will get restless and look for their own (possibly destructive) activities, like digging or tearing at furniture. (Without proper training, the dogs might also attempt to herd small children.) In the field, Aussies herd by nipping at their targets, so they have a natural tendency to bite, even in play. You need to be mindful of this behavior when training at an early age. Luckily, their high intelligence makes them very easy to train. 4. THEY HAVE COLORFUL COATS. The outdoorsy dogs come in two colors: red and blue. The coats can either be speckled or mottled. Speckled coats are light spots on a dark background, while mottled are the inverse. Regardless of color or pattern, all the dogs have water-resistant double coats. The raincoat-like fur allows water to bead and glide right off, keeping the pup mostly dry and happy. These healthy dogs are made for the outdoors. Thanks to their relation to the hearty dingo, they can run for long stretches of time and have seemingly endless energy. Their average lifespan is 12 to 15 years. 6. ONE WAS THE OLDEST DOG IN THE WORLD. If you’re not impressed by the dog’s long average life span, you might be impressed by Bluey, the oldest dog to ever live. The ancient Australian cattle dog was born in 1910 and happily chased sheep for almost 20 years. The strong-willed pooch was put to sleep in 1939 at the ripe old age of 29 years and five months. In 2009, an Australian cattle dog named Sophie lived through the ultimate canine survival tale. While on a boat with her family off the coast of Queensland, Australia, the dog was thrown off when the craft hit a rough wave. The resilient pup swam five miles back to shore and ended up on St. Bees Island, an island inhabited mostly by wild horses. Sophie managed to stay alive by hunting feral goats. Eventually she was nabbed by a ranger and reunited with her family. "She surprised us all," her owner told AFP. "She was a house dog and look what she's done—she's swum over five nautical miles, she's managed to live off the land all on her own." 8. THEY MAKE GREAT COWBOYS. Dan McManus has been hang gliding for over 33 years, completing thousands of flights. He doesn’t go alone, though: When flying, his Australian cattle dog, Shadow, comes along for the ride. Shadow is a psychiatric service dog who helps McManus with his separation anxiety. The two take to the Utah skies and work together at Eagle's Nest Hang Gliding & Paragliding. “He wanted to go along, and he didn’t really like to see me up there by myself,” McManus said. “He needs to keep me safe, so he needed to go flying with me to keep me safe.” Shadow is suspended in a harness and likes to keep his paw on his owner’s arm.